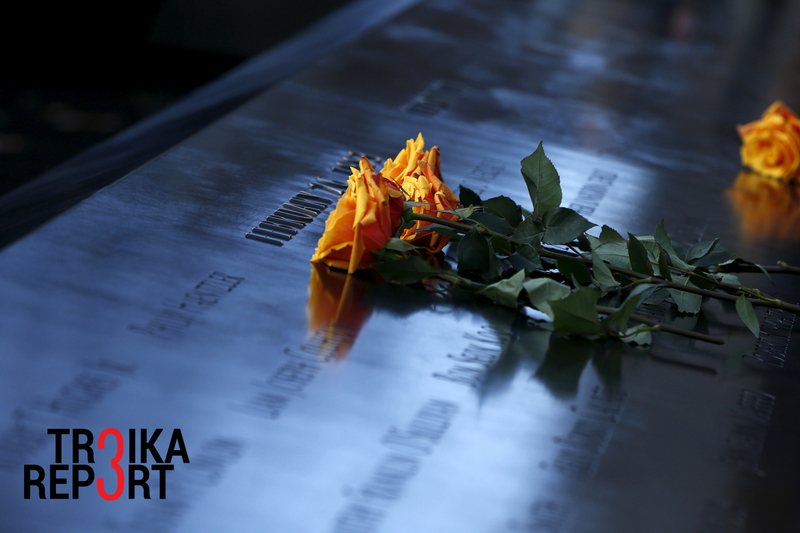 Flowers at the 9/11 Memorial. Fifteen years down the road, the ramifications of the War on Terror launched by President George W. Bush after the deadly terror attack on the U.S. on Sept. 11, 2001 are as multi-faceted as they are controversial. There appear to be few “best practices” to apply but plenty of unlearned lessons. The landmark tragedy of 9/11, when almost 3,000 people were murdered by religious fanatics who struck hijacked planes into New York’s World Trade Center and the Pentagon in Washington, D.C., is also a story of personal courage and of a resilient nation united in its grief and resolution to fight a new, sophisticated evil. History school textbooks will certainly do justice to the bravery and efficiency of the New York rescuers who evacuated over 20,000 people from the Twin Towers and adjacent area, ferried over 500,000 from Lower Manhattan, and later provided psychological assistance to those suffering from a traumatic shock. And yet, the story of 9/11 is also a story of roughly a trillion dollars spent by U.S. administrations since then on fighting terrorism. Neta C. Crawford, a professor of political science at Boston University and co-director of the Costs of War project, claims the actual price is $1.8 trillion. While “homeland security” was upgraded (as it is known, the U.S. has “cowboyed up”) and effectively shielded the American people from a repetition of an attack from outside, the projection of the “war on terror” abroad amounts to a track record of foreign policy miscalculations that unfortunately have aggravated global tensions and divisions. U.S. President George W. Bush was able to rightfully take these words out of bin Laden’s mouth and use them to justify air strikes targeting the Taliban in Afghanistan, which had provided asylum for the number one terrorist. In 2003 came the dubious victory in the Iraqi war, which was distinguished by a number of controversial features. The weeks of aerial bombardment of Fallujah, reducing it to ruins and rubble. The deployment of ground troops. The surge in the number of occupational forces that initially produced some positive results. The thousands of Iraqis tortured in prisons such as the notorious Abu Ghraib. It also entailed persecution of the officials of Saddam Hussein’s Baathist regime and the military. In a broader context, it led to the estrangement of the former dominant group, the Sunni Muslims. Eventually, the “losers” united, forming the Islamic State of Iraq and Syria (ISIS), and these battle-hardened fighters launched a counter-offensive that saw at one time almost one third of the combined territory of Syria and Iraq controlled by the champions of a new Caliphate. Moreover, ISIS recorded worrisome successes in recruiting militants from all around the world, including Westerners who then would pose in balaclavas and orange jackets before a video camera demonstratively beheading their “infidel” compatriots. On top of accumulating expertise in counterintelligence, forgery and smuggling, ISIS managed to build a narrative appealing to disoriented and disenchanted young Muslims in Europe, Asia, and also in Russia. Radical preachers also learned to use PR and manipulative social network technologies to their advantage. Now, how do you handle “a myriad of enemies”? Do you “cowboy up”? But brewing hostilities between the two largest world economies would be detrimental and even destructive for the whole fabric of international relations. It would derail the process of forging a fairer new world order and leave us defenseless in the face of a formidable adversary, the global terrorist international. Today, the new wave of “annihilistic terrorism” has exacerbated the dangers to the lives of millions of people. It’s an existential threat. Terror attacks in London, Paris, Brussels, and more recently in Nice, Orlando, and San Bernadino (in the latter cases, not ISIS-executed but ISIS-inspired) have generated a deep-seated premonition among ordinary people that the War on Terror looks unwinnable. The mood in a bereaved Europe failing to come to grips with the “migration crisis” is gloomy. The resentment of locals toward the newcomers, who often struggle to integrate, is leading to the alienation of European Muslim communities. Sectarian animosity is in the making. It’s an explosive mixture that is attracting radicals on all sides of the spectrum. The symptoms of new isolationism raising its head in the United States, while commendable for a retreat from meddling in the affairs of other nations, are nevertheless troubling. While creating a feeling of security inside “Fortress America,” this might evolve into a reluctance to commit political will and resources to fighting global terrorism. Not all the lessons of 9/11 and the ensuing War on Terror were properly understood, let alone used as guidance in shaping policy priorities. This is yet another reason why the “old world order” is continuing to spin out of control, making us feel less and less secure.